Andani was interested to meet Cameroonian-Nigerian volunteer Obed when Andani visited Children of Fire for medical tattooing to darken the pink patch in the centre of his cheek. Andani Mphapuli hoped to matriculate in December 2009. His school subjects included agriculture and tourism. 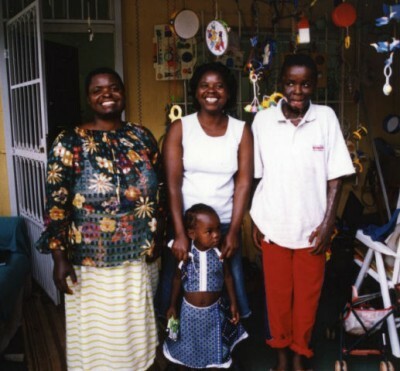 He has also been trying to track down his errant father who has never supported him financially, and is pictured here with his aunt (his father�s sister) and his cousin, whom he met for the first time in mid 2009 as part of his family quest. If anyone can give Andani an internship in tourism, he would really appreciate a chance in life. Andani Mphaphuli was born on January 27th, 1990. He lives with his mother and little sister in rondavels in the former Venda homeland area of Limpopo province. He came to stay with Children of Fire at the very beginning of January 2005 and we successfully arranged neck surgery for him for February 2nd, 2005. 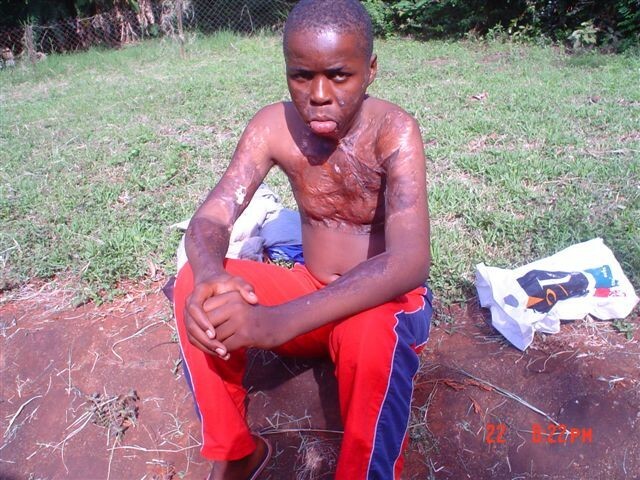 He is from a little village in Venda and was set alight by his stepfather (who has been jailed for 107 years...). The village is ruled by a headman vho-Ranwedzi and the chief if Vusani Munyadziwa Netshibupte. It all falls under the Makhado Municipality in Limpopo Province. 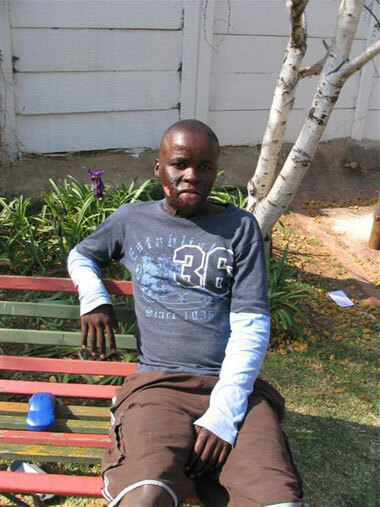 Andani is a quiet boy who was in a mixed class of 35 children in Grade 7 at his rural primary school. He said that he had no friends in the class. When pushed to imagine, e.g., being stuck on an island with one fellow pupil, he chose Godfrey 'because he's clever'. He said that he is teased a lot, but that the names used to mock him are in his home language Tshivenda. He thought hard about which ones were translatable and said that they typically called him body (as in 'corpse'). When he went to hospital in the past, he found it a struggle to catch up with mathematics on his return as the teachers did not prepare material to take with him, nor did they make any effort to help him catch up when he came back. At the suggestion that he should insist on being given work to take with him, he laughed. 'I cannot do that, they will hit me.' The teachers in his primary school beat pupils regularly, with a large stick. We told Andani that this was against the law and that he had the right to go to the police station, to get a senior police officer to accompany him, and then to talk to the principal of the school about the laws against corporal punishment. 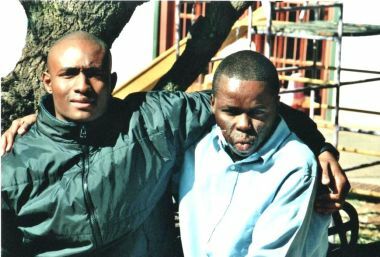 At the Johannesburg School for Blind, Low Vision and Multiple Disability Children run by Children of Fire, Andani worked on some applied mathematics with teacher Lesiba Makaqa, on the structure of the skin with Judith Herbert, had reflexology with Sue Richardson, and geography lessons from Sue Le-ba. He also attended a St John Ambulance Level One First Aid course for three days. He only secured a mark of 38 per cent but this was mostly attributed to his limited English vocabulary. He will hopefully retake the examination after surgery. In common with many of the children that we see, it seems that his initial medical treatment was reasonably good but that there was no long term plan for occupational therapy and general followup. Hence he has a lot of distress and discomfort that could have been avoided and surgical problems that are far more complicated than need have been the case. His neck contractures will now be very hard to deal with and he has pressure garments for the side of his face that (by all the stretch in them) he seems to have never worn. 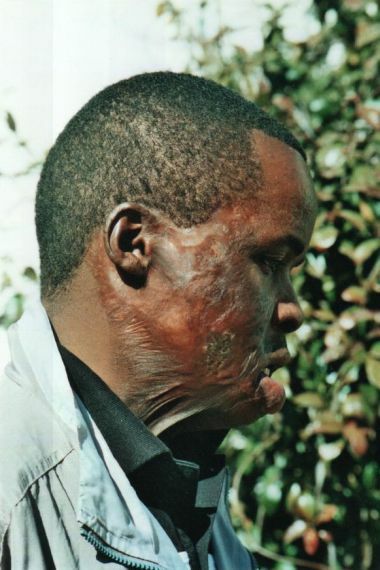 His mother was also burned in the attack and has keloids on one side of her face (left lower jaw) and a partially immobile left hand, but no one has ever offered her pressure garments, OT nor reconstructive surgery. They live in circular mud huts and survive on small grants. Andani apparently did have some sort of surgery at Garankua as well as at Polokwane (Pietersburg) but the release of his left inner elbow was not followed through with release of his right inner elbow. It is common practice not to do both arms at once, but the fact is that no date at all was set for him to return to any hospital for further surgery. He was due to start High School in 2005 and is quite bright, even philosophical, considering all his disadvantages. He wants to become a doctor. Because his mouth/neck are not as mobile as we would like, because of his distress at what happened to him and at the subsequent teasing for disfigurement that he has suffered, he speaks very quietly. He is shy and at first seems a somewhat solitary, sad, chap but started to come out of his shell after two days. It is hard that he cannot smile effectively because of the facial contractures. He enjoyed the candles on the Christmas tree (made extra necessary by the increasingly frequent Auckland Park powercuts) and the Christmas music. He was unfamiliar with the Christmas story and had never been taught it at school. We told him that, regardless of one's beliefs, that it is useful to know key facets of religions because they are reflected so much in literary references e.g. in Shakespeare that he will certainly have to learn in high school. He coped well with meeting other more severely burned children. 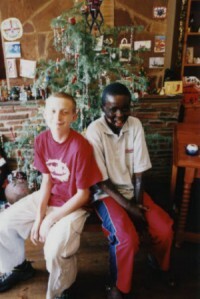 He has also had regular sessions with a counsellor Barbara Lancaster-Tidy since he arrived in Johannesburg. We also contacted the head of surgery at Garankua Hospital to try to ascertain what processes were undertaken there and on what dates. It seems that reconstructive surgery available at Polokwane is extremely limited as a surgeon only travels there from Pretoria once a month. 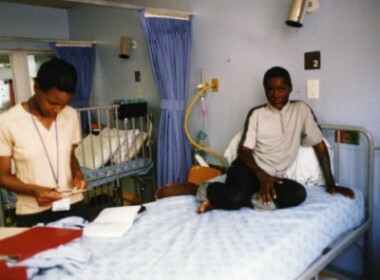 Andani was last operated on there in September 2004. There is enough work to justify a surgical team being permanently available at Polokwane. Children of Fire is enquiring about getting a better surgical programme going in the far north of the country and more proactive OT work on these children - regardless of the interest/ caring/ educational level of their parents or guardians. Social workers should be the ones to ensure that children attend appointments and have sufficient transport money to get to and from hospital, but we have not yet met a really good social worker in the state sector. Since aring, to n Johannesburg, Andani has been to watch classic car racing, to see an animal park in Benoni, to watch the circus, to Children of Fire's reading scheme in Joe Slovo squatter camp, and he has had a lot of individual tuition including on Saturdays and Sundays. 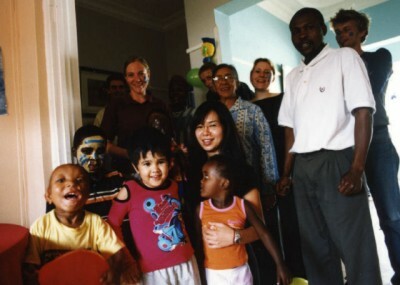 His first ever birthday party included pinning a tail on a donkey, cake, balloons, face painting and plenty of presents. He has played soccer and cricket with the AIESEC volunteers. The family depends on Andani's disability grant (R740) and his sister's child support grant (R170). His biological father reneged on child support and has not been since for many years - According to his mother, Andani has never met him and she does not even know his surname. The father of his sibling is the one who tried to burn the entire family with petrol. Andani's concerns are that people are scared of him; children scream and run away, others say he smells bad and won't eat in his presence. He passed Grade 7 at Sigwavhulimu Primary School and will return to Grade 8 at Mutheiwana Secondary School during the course of 2005. However our assessment at the Johannesburg School for Blind, Low Vision and Multiple Disability Children found that Andani had not really met the learning outcomes required for Grade 7. He said the pressure garment around his neck causes pain and irritation. As it broke the skin, we decided that he did not need to wear it until after surgery and gave him topical antibiotics to apply. He has relatives in Braam Fisher, Soweto. The Thohoyandou Victim Empowerment Programme (TVEP) - a Venda-based project - arranged transport to Johannesburg with Fabienne Le Floch, a Voluntary Services Overseas employee. The TVEP) nurse visited the family with a digital camera to send Children of Fire the initial photographs, and compiled a brief report. Fiona Nicholson faxed over a newspaper article about the case. TVEP tried to liaise with a doctor in Polokwane but said that they could not find anyone particularly helpful. Fiona Nicholson, Programme Director in Thohoyandou said: 'The doctor seemed to think there is no need to do more, because a plastic surgeon comes to Polokwane every month'. He did not respond to emails. Andani lives 200 kilometres away from Polokwane hospital. In ohannesburg he will become part of the extended Children of Fire family and will get the followup therapies that he needs. Please email firechildren@icon.co.za if you think that you could help.